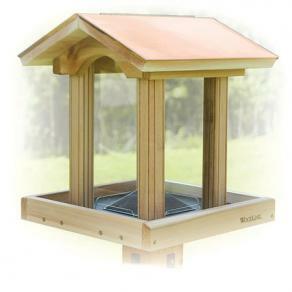 Woodlink Coppertop Hopper Bird Feeder-BEST PRICE! Do you want to feed a lot of birds and not worry about filling up the bird feeder? Watch colorful birds fly thru to this large capacity bird feeder. A great bird feeder for your summer home when you want to still feed the birds when you are gone. This giant sized feeder will keep the birds happy as well as you allowing less trips to fill the bird feeder! Great Size and Woodlink quality make for one nice bird feeder. High Capacity: A WHOPPING 10.5 quarts of seed capacity! This huge COPPERTOP allows birds to fly to and feed from all four sides.